Washing my kitchen floor has never been easier and I can actually get the kids to do if for me because they think it is fun. The way I can keep the clean and dirty water separated. My floor has never felt cleaner. It is an old floor so it always looks blah but now it feels completely clean and I feel like I can literally say, you can eat off my floor. The 360 spin on the mop. I feel like it can get every nook and cranny in my kitchen and hall. I love that I can toss the mop in the wash if I need to clean it. So far it looks amazing and barely looks used even after 10 uses. I think it is because it really gets everything clean and keeping the water separated means once I spin it, the dirty, filthy water of the first time was gone before I applied to the floor again. When you put the mop into the spin area (the area that looks like a drain, you spin it to nearly a damp mop. It takes way less time for me to dry my floors now. The only con is that I wish there was a spin area on the clean water side because I feel like I need to rinse out some of the water before putting it down on the floor but don't want to waste water and cleaning product so I don't put it on the other side allowing the clean water to go into the dirty water. I usually just give a squeeze with my hand. 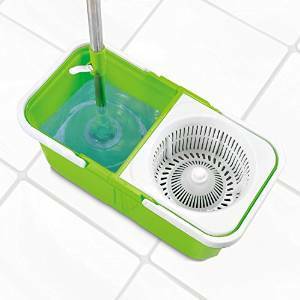 Cleaning the bucket is super easy and with the drain plug, I can empty the dirty water easily. Putting the mop together was easy. It comes in three pieces and then you need to snap the mop head onto it.